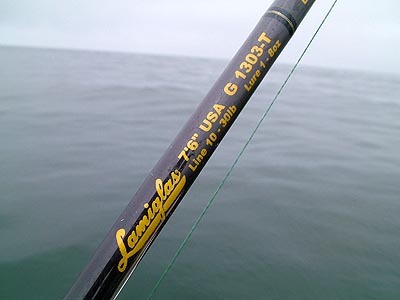 Introduction: Lamiglas�s G1000 series rods were always built to be rugged, but a new graphite design delivers a superior balance of weight, sensitivity, and pure brawn. The G1303-T Back Bouncer may be designed for heavy metal back bouncing techniques, but this smart rod proved to be a multi-talented performer. About Lamiglas: Lamiglas was founded 52 years ago not far from their current location in Woodland, Washington. With the Pacific to the West, trophy Salmon and Steelhead rivers to the North, Cascade lakes and streams to the East and the mighty Columbia River to the South, angling opportunities abound. So the team at Lamiglas gets to eat, sleep, and breathe fishing. For 2004 Lamiglas introduces new series of rods, while enhancing their already popular models in an effort to make them lighter and more sensitive. Lamiglas believes that excellent rod design will lead to the ability to employ new angling techniques, and we agree. Impressions: The Lamiglas G1303-T Back Bouncer is a member of the Lamiglas G1000 series rods. These are Lamiglas�s most popular rods in history, and for 2004 a new hand polished natural graphite finish is found on every rod in the series. While the new look is clean and attractive the real benefit is a noticeably lighter and quicker action rod. When I first examined the rod, I couldn�t help but notice how nice the fresh graphite looked, and I marveled responsive the 7�6� rod felt in basic telegraph tests. When Backbouncing anglers will employ heavy metal and I wondered if it was necessary to wield such a lightweight and sensitive rod, but these fine attributes are certainly welcome. Real World Test: Testing the G1303-T entailed some bouncing of heavy metal and bait on the ocean and river floor. 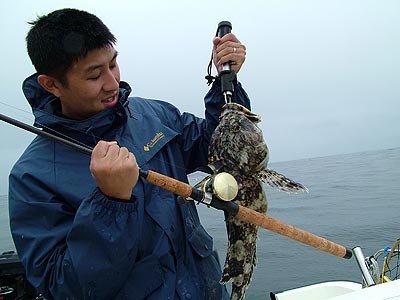 We also found the rod attributes excellent for some additional applications, and put the rod to additional use by bouncing heavy diamond jigs on the sea floor for rockfish. Casting/Retrieving: Backbouncing is an intriguing technique used primarily by Northwest steelhead and salmon anglers. To fish a run, heavy lead is used to put the bait right on the bottom and, with the help of the current, literally �bounce� the bait downstream, keeping it right in the strike zone. The rod must have the power necessary to lift the weight off the bottom and still have sufficient power to set the hook with authority. 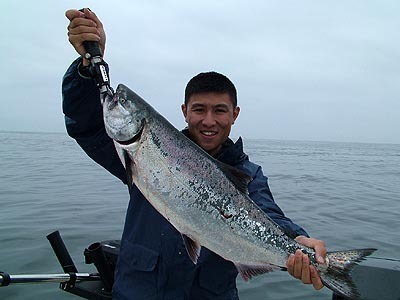 A heavy-duty rod with a stiff tip is crucial, because many times the fish are smack dab in the heaviest current and you require a plenty of lead, not to mention big Salmon can weigh excess of 40+ lbs. The rod casts heavy weights and lures a reasonable distance, but most of the time anglers will toss the weight and let the current play into the equation. 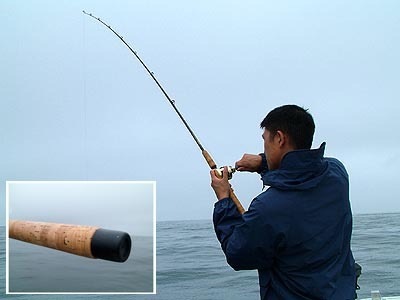 The G1303-T is perfect for this technique and arcs very nicely on the retrieve, and the extended cork handle provides that extra leverage to help gain control over even the biggest Salmon or Steelhead. 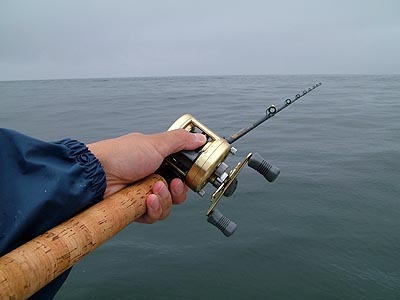 Sensitivity: The rod feels accurate and refined on the retrieve, very unlike many other saltwater rods which are designed overly tough, sacrificing a great deal of feel in exchange for raw power. The Back Bouncer performed admirably, and was sensitive enough to feel just about each and every piece of structure 80 feet down. When hooked up with irate Lings or hefty Cabazons the Back Bouncer felt confident, and didn�t even break a sweat bringing fish up to the surface. Overall the Back Bouncer showcases a superior balance of refinement and muscle. Power: This rod boasts phenomenal weight flexibility. By looking at the rod you wouldn�t believe how much metal it can effectively be paired with. In fact it looks quite refined and more akin to a bass flipping stick than a big fish rod. What we liked most about the rod was the strong base of blank which was able to load up instantly. When bouncing baits and lures on the bottom you will find that retrieves take a lot longer as the fish are coming up from the deepest possible depths. It�s nice to know that the graphite blank can brook plenty of weight, and does so with assurance. Price: The G1303-T Back Bouncer retails for 210.00, a reasonable price for a rod of this quality, and bearing a respected brand name like Lamiglas. The nice thing about Lamiglas is that they have a lot of rods to choose from. For example, if you are a Steelhead and Salmon die-hard, chances are that Lamiglas has a rod with your name on it, as they offer complete ranges of rods from eight series of rods�and that�s just in this species application (118 rods just for Salmon and Steelhead to be exact). The G1000 series rods are about mid-way through the Lamiglas lineup, and more budget conscious anglers can consider the more affordably priced Norwest Special and G200 rods. But in the entire lineup we recommend the G1000 rods and the Certified Pro rods because they are priced sensibly and offer performance that rivals rods costing well over 300 dollars. Applications: If Salmon and Steelhead are your passion and you live in the North West and are lucky enough to have access to deep rivers and the ocean the G1303-T is an ideal choice. But the rod�s duty shouldn�t terminate there. The attributes and ability to toss heavy metal ranging from 1-8oz make it a prime contender for tossing diamond jigs and bullet weighted plastics. We paired the Back Bouncer with a Calcutta 250 and spooled up with braided line to see how the rod felt pulling bottom fish duty, and the performance was superb. 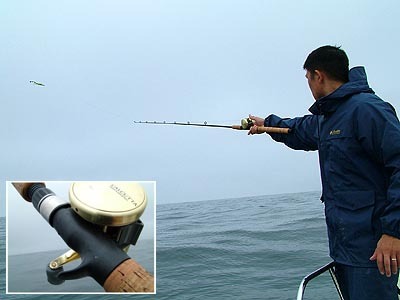 Just as it is always good to bring a backup rod and reel, knowing other techniques for catching fish can only improve your chances of success. There are certain conditions when trolling for Salmon is going to be the most effective, sometimes mooching produces great results, and there are times when the Salmon and Steelhead are deep in channels or pools where back bouncing will prove lethal. Conclusion: For fifty-two years Lamiglas has built a reputation selling quality blanks as well branded rods. This year Lamiglas makes bold moves with exciting new products, refined existing lines, and even an attractive new website for anglers to peruse. The Back Bouncer is the first Lamiglas rod we have tested in two years, and we were impressed. The Back Bouncer is every bit as good as the new competitor offerings, and when you consider the price it just might be better. 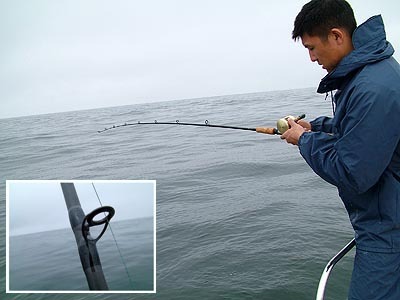 This rod is designed for a specific application, but anglers fishing diverse species in different types of water can still make use of this multi-talented fishing stick.